To do, to be and to go are some of the biggest problems for subject and verb agreement. 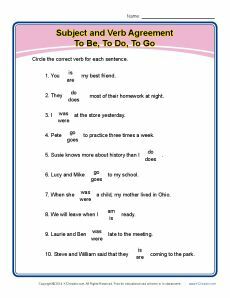 This worksheet focuses on these troublemaking verbs. While it’s a great way to work on 3rd grade Language for Common Core Standards, it may also be a good diagnostic tool or a helpful practice for other students.